, FlumeJava, and MillWheel into a single product, Google Cloud Dataflow. It's designed to reduce operational overhead and make programming and data analysis your only job, whether you’re a data scientist, data analyst or data-centric software developer. Along with other Google Cloud Platform big data services, Cloud Dataflow embodies the kind of highly productive and fully managed services designed to use big data, the cloud way. Merge your batch and stream processing pipelines thanks to a unified and convenient programming model. The model and the underlying managed service let you easily express data processing pipelines, make powerful decisions, obtain insights and eliminate the switching cost between batch and continuous stream processing. Finely tune the desired correctness model for your data processing needs through powerful API primitives for handling late arriving data. You can process data based on event time as well as clock time and gracefully deal with upstream data latency when processing data from unbounded sources. Leverage a fully-managed service, complete with dynamically adaptive auto-scaling and auto-tuning, that offers attractive performance out of the box. Whether you’re a developer or systems operator, you no longer need to invest time worrying about resource provisioning or attempting to optimize resource usage. Automation, a fully managed service, and the programming model work together to significantly lower both CAPEX and OPEX. Enjoy reduced complexity of managing and debugging highly parallelized processes with a simplified monitoring interface that’s logically mapped to your processing logic as opposed to how your code’s mapped to the underlying execution plane. Benefit from integrated processing of data across the Google Cloud Platform with optimized support for services such as Google Cloud Storage, Google Cloud Datastore, Google Cloud Pub/Sub, and Google BigQuery. We’re also working with major open source contributors on maturing the Cloud Dataflow ecosystem. For example, we recently announced collaborations with Data Artisans for runtime support for Apache Flink and with Cloudera for runtime support for Apache Spark. We’d like to thank our alpha users for their numerous suggestions, reports and support along this journey. Their input has certainly made Cloud Dataflow a better product. Now, during beta, everyone can use Cloud Dataflow and we continue to welcome questions and feedback on Stack Overflow. We hope that you’ll give Cloud Dataflow a try and enjoy big data made easy. Big data applications can provide extremely valuable insights, but extracting that value often demands high overhead – including significant deployment, tuning, and operational effort – diverse systems, and programming models. As a result, work other than the actual programming and data analysis dominates the time needed to build and maintain a big data application. The industry has come to accept these pains and inefficiencies as an unavoidable cost of doing business. We believe you deserve better. 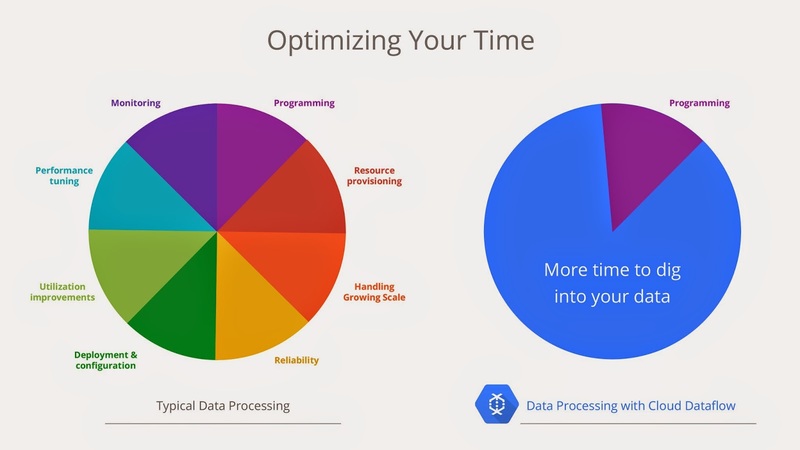 In Google’s systems infrastructure team, we’ve been tackling challenging big data problems for more than a decade and are well aware of the difference that simple yet powerful data processing tools make. We have translated our experience from MapReduce, FlumeJava, and MillWheel into a single product, Google Cloud Dataflow. It's designed to reduce operational overhead and make programming and data analysis your only job, whether you’re a data scientist, data analyst or data-centric software developer. Along with other Google Cloud Platform big data services, Cloud Dataflow embodies the kind of highly productive and fully managed services designed to use big data, the cloud way.